One of my cornerstone components in losing weight has been having a good feedback system. I discovered that I couldn’t do it with just diet and exercise. There was something missing. In past attempts I would faithfully journal my meals, hit the gym to excess and then jump on the scale only to have my hopes dashed. Enter the feedback system – weighing yourself daily (yes, you read that right!) to get a trend line like mine below. I log my weight daily using The Hacker’s Diet Online tool and also the Libra Android App (for convenience.) Both give similar graphs and I will add links to the Resources page. I will also blog more about this topic in the future. My weight-loss graph shows my starting weight of 280 when I first went grain-free / sugar-free in May, 2013 through today, July 27, 2014 at 175.9. Fingers crossed that I meet my short-term goal of 175 by the 31st! My highest weight was in 2010 when I weighed 310 pounds. 2. Set up your account and start logging your weight daily. 3. 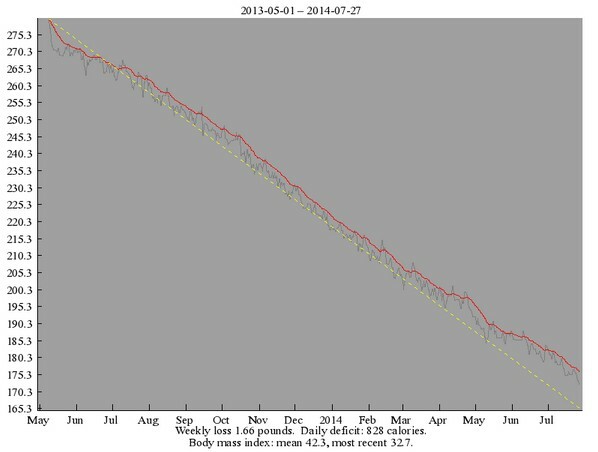 View your trend line (red line) and notice how your daily weigh-ins affect the direction of the trend line. As long as more weights fall below the trend line than above you are pulling the line down and are losing weight. If you notice that your trend line is level then you are maintaining and of course if the trend line is moving up you are gaining. page so other readers can view and comment on your progress! Note: To view trend lines you have to have an account set up at Hacker’s Diet Online first. Tracking my weight daily gives me a trend line!